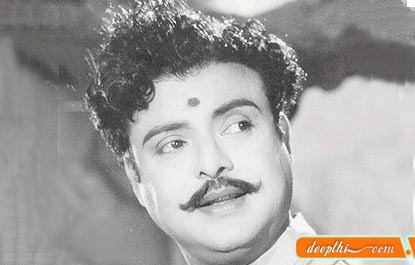 Gemini Ganesan (17 November 1920 � 22 March 2005) was a famous Indian actor. He is well known as kadhal mannan (king of romance) of Tamil Cinema for the romantic roles he played in movies, and his private love affairs. Gemini Ganesan was born on 17 November 1920 at Pudukottai in South India to Ramaswami and Gangamma. The family was a middle class smartha brahmin family belonging to the Mulukanadu subcaste. Ganesan was the only male heir to his family. His grandfather Narayanaswami and aunt Muthulakshmi were the source of inspiration for Ganesan in early days. Education of his grandson was the most important priority for Narayanaswami. When he was at an early age, Ganesan's education was initiated in grand style: he was sent to school on horseback, preceded by a band playing music. The teacher made him write the alphabet �a� in Tamil language on a silver plate with a gold coin. Ganesen�s father Ramaswami was a handsome man with curly hair, who took great care of his looks, hairstyle and attire. An expert in playing the mridangam and the flute, Ramaswami was interested in arts and music. Although Ramaswami did interest himself prefunctorily in the family farms, it was grandfather Narayanswami who took care of the family. When Ganesan was in 6th class, he lost his much beloved grandfather; later, his father Ramaswami also died. Now Ganesan with his grandmother Bagirathi and mother Gangamma migrated to Madras to live under the care of aunt Muthulakshmi Reddy. Ganesan�s mother Gangamma did not take to city life. She settled down in Pudukottai. Ganesan's aunt, Dr. Muthulakshmi Reddy, was a follower of Sri Ramakrishna Paramahamsa; she admitted Ganesan into the Ramakrishna Mission home at Mylapore. There, he learnt Yoga, Sanskrit, read about Vedas, Bhagavad gita and Upanishads. Life here taught him discipline; Ganesan became an expert in Yoga. However, separation from his mother being too much for him, he went back to Pudukottai and joined high school there. His end came at 22 March 2005, 13:30 IST at the age of 84 in his residence after a prolonged illness. He was cremated with full state honours. He is survived by eight daughters and a son. His children are: Dr. Revathi Swaminathan; Dr. Kamala Selvaraj; Ms. Narayani Ganesh; Dr. Jaya Shreedhar; the film actress Rekha; Ms. Radha Usman Syed; Ms. Dhanalakshmi Sapru; Ms. Vijaya Chamundeswari, and Mr. Satish Kumar. Ganesan was one of the few graduates to enter the film world in those days. Mr. Ganesh (Ganesan) did not take the traditional route of the theatre to the tinsel world. His first job was as a Lecturer at the Madras Christian College. His first cinema-related work (Production Executive in 1947) with the Gemini Studios added the title Gemini to his name. From the casting department, Ganesan got his first break in films with Miss Malini. This was followed by Chakravarthi, in which he played Lord Krishna. However, not until 1953, when he played the villain in the film Thai Ullam, did people take notice of him as an actor. The next year, he was upgraded as a hero with Manampol Mangalyam. The film paired him with Savithri, who became the mother of two of his children � a daughter and a son. From then on, he carved out a niche for himself in Tamil cinema with films that required a lot of `romance' but little `action'. Ganesan was one of the "Big Three" of Tamil cinema, the other two being the late M. G. Ramachandran and Sivaji Ganesan. Although Sivaji excelled in films with drama, and MGR dominated movies with thrilling fight-scenes and, Mr. Ganesh held his own with sensitive portrayals of the yearning lover. Fondly known as Kadhal Mannan (King of Romance) among his fans, Ganesan had acted in several box-office hits during his heydays (1950s�1970s). He was awarded the Padma Shri in 1971. Gemini Ganesan's performances on the screen were enhanced by some talented playback singers like A.M. Rajah and P.B. Srinivos. P.B. Srinivos's mellifluous voice in particular complemented Gemini Ganesan. The song "Kalangalil Aval Vasantham" will always be remembered and associated with Gemini Ganesan as well as P.B. Srinivos. He had paired with many top heroines such as Savithri, whom he later married, Anjalidevi, Banumathi, Padmini, Saroja Devi, former Rajya Sabha member Vaijayanthi Mala, "Sowcar" Janaki, Vijaya, Devika, and the Chief Minister of Tamil Nadu, Jayalalitha. Later in his career, he switched to little different character roles. Notable among these was Avvai Shanmughi (1996), in which, quite characteristically, he entered into the skin of an old man longing for an old maid. Towards the end of his acting career he kept himself busy with elegant roles in television serials. In his long film career spanning over five decades he had acted in more than 200 films, including a few in Hindi, Telugu, Malayalam and Kannada.